Innisville is situated on Provincial Highway 7 where it straddles the Mississippi River, half way between Perth and Carleton Place. Innisville was originally named Freer’s Falls or Freer’s Rapids after Captain Noah Freer, a veteran of the War of 1812 who received a deed from the Crown in 1821 for all of Lot 20. The village was later named Ennisville after James Ennis who had the first mill there. Ennis would come to Canada in the spring, work the land, and return to Ireland for the winter. When the post office opened in 1851 a clerical error resulted in the community being called Innisville. The error was never corrected. 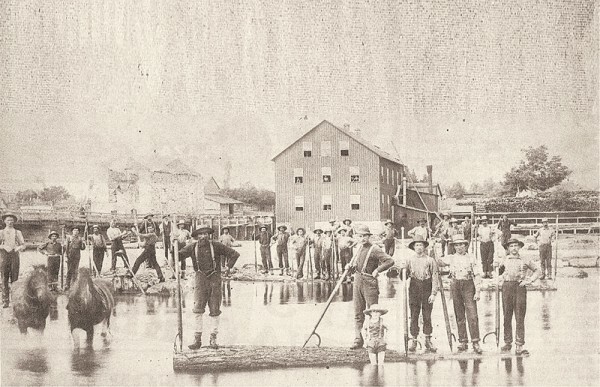 Innisville was a mill town with a huge dam an active woollen mill, sawmills, shingle mills, two flour mills and a grist mill. As well there were a couple of taverns, a hotel (which housed the general store and post office), blacksmiths, cooper and shoe shops, a school and at least one church and community hall. Eventually the mills disappeared and the village became quite a resort town. Some of the original cottages are still in use. In 1959, the Mississippi Lake Migratory Bird Sanctuary Wildlife Area was established to protect staging waterfowl before becoming Mississippi Lake National Wildlife Area in 1971. It covers an area of 307 hectares located within the wetlands of McEwen Bay, where water streams in from the Mississippi River. The small bay is one of the few natural areas left on the Mississippi Lake shoreline. Muddy silt and debris support rich stands of wild rice, cattail and other plants, well sheltered by a peninsula and island at the mouth of the bay. The bay that collects the river silt provides lush stands of aquatic plants that feed thousands of migrating ducks each autumn. Because of its location Innisville has always been a hub of activity. Its general store, LCBO outlet and gas station carry all the necessities. There is a MTO roadside park that provides a tranquil place for Highway 7 travelers to stop, eat and stretch their legs. Law and Orders, a popular restaurant, proudly boasts of the “Rhippo Challenge,” a food eating contest that very few participants have won. We invite you to stop by the River and see if you can spot the pickerel making their way upstream or enjoy a cooling picnic at the roadside park. It is always a welcomed excuse to stretch your legs.